Continuation of Shaman, by Warren Cullar. Nonfiction. 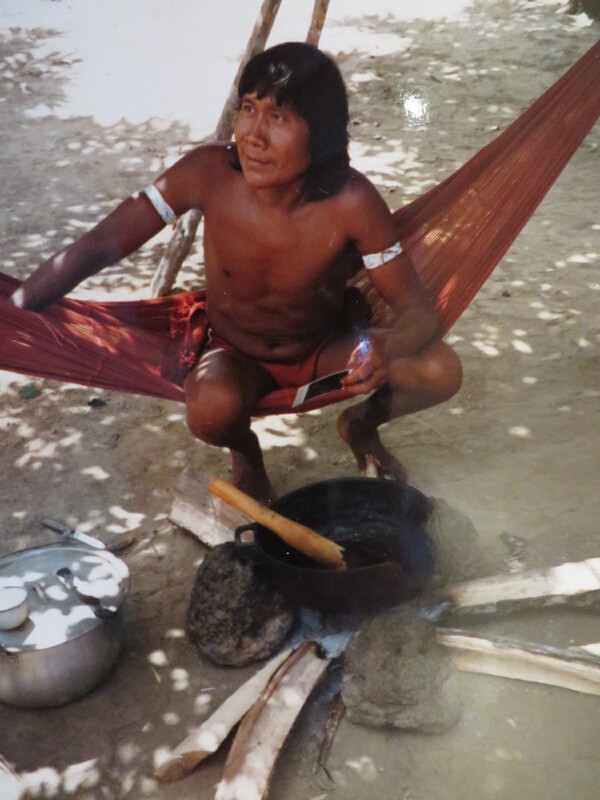 A tribesman in Amazonia cooking curare, the poison used on blowguns. Our contact with the natives was a visit to three different villages. The first village was under government control, with government housing: basic, one-room concrete structures where the natives were wearing western clothing. I was able to buy a bow with three arrows from a young man. The second village was a long drive, then a hike on a path through the tall grass into a village. When we were spotted, all the women disappeared into their square huts, some covering their breasts. With patience we were slowly recognized as calm people bringing gifts. We placed mirrors at the entrance to each hut and gave fishing line and hooks to the men. We walked through the village of thatched huts, observing the people. One man was outside of his hut, sitting in his hammock, stirring an old cast iron pot. His two young sons stood behind him. The hard packed earth was home and necessities were modest: A hut, a hammock, a blowgun, a cooking pot and a machete. When they needed food, they went into the jungle, found it, and then relaxed until the need to find food again was apparent. The expression on the man’s face making his dart poison was peaceful, relaxed, yet he was somewhat bothered by these white strangers. Jacob (left) and Warren (right) working on My Dad, Napoleon and Me. Jacob Pousland here, Warren’s writing coach, editor, and all-around technology assistant. Warren and I have been working hard for the last few weeks editing My Dad, Napoleon and Me. After all our hard work today’s the day: we’re sending My Dad, Napoleon and Me out to two editors and an agent who have agreed to take a look at it. If one of them likes the book we’ll be well on our way to publication. New books are usually slotted for publication a year in advance, so even when we are published it will be a while before you’ll see us on shelves, but we’re confident that My Dad, Napoleon and Me is as polished and well-written as we can make it at this time. The following story is an excerpt from the chapter Shaman of Warren’s book My Dad, Napoleon and Me, currently in rewrite. The crack of the billiard balls on the green felt tables at Erick’s Billiards was heard over the music, clinking beer bottles and noisy crowd as I pushed open the glass door. I had attempted to play pool when I was in the corps, but there was always some guy wanting to take your money. A soft layer of blue smoke hung below the pool table lights, like artificial smoke in a bad play. I was there on an invitation from a university professor, a strange place to meet for an appointment. One of my collectors had told me about the expedition because the word was out I went on adventures. Raising my hand to join this adventure was a decision I had made on the barest of facts. The expedition was scheduled to go to Southern Venezuela’s Amazonas State with a group of men and women of science. They were to explore the indigenous people’s encampments along the Orinoco River on the Venezuelan and Colombian border. The pool hall meeting was called by the professor in charge of leading the expedition. My job would be as the artist: to sketch and paint in watercolor, reproducing the native art that had been painted on ceilings and walls of the sheltered caves in the region thousands of years ago. 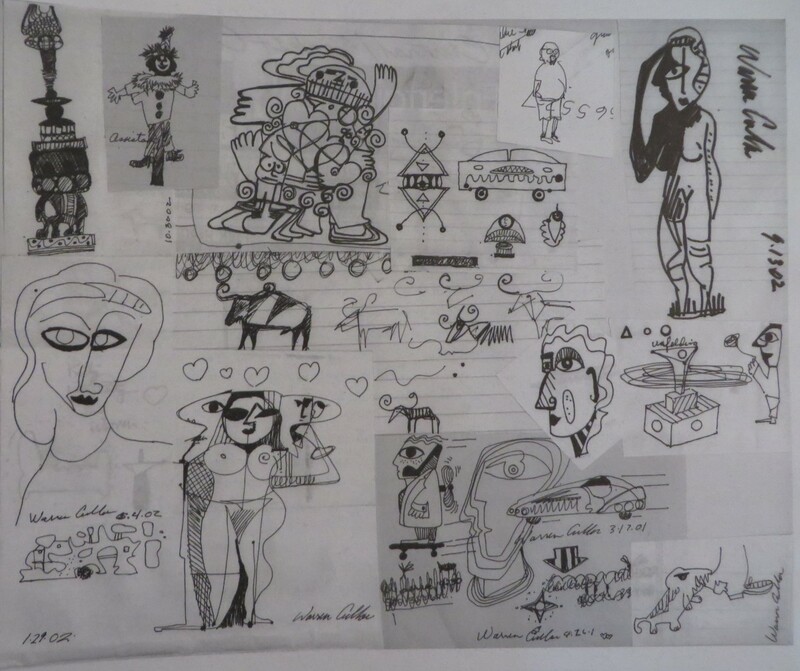 Several times in elementary school, I was stopped from doodling in the margins of my notebooks. Today, I draw everywhere except in the margins – ha! I draw when there is a pen and paper and there is down time. For me, happiness is creating. When I’m doodling, there is limited awareness of what’s taking place. I focus on something else like a conversation or just relaxing. There is no concern for the direction or the outcome of the drawing. The only purpose is to make marks and images and follow my creative muse. I am just enjoying life when I am doodling. On an expedition to the Amazonia State in Southern Venezuela with the University of Texas I had real Indiana Jones Experiences.